Friends of Tai Long Sai Wan (FDOTLS) and Save Our Country Parks (SOCP) recommend the “We share, We love, We support” appreciation walk to Tai Long Sai Wan this Sunday. The walk and visit of the beach is recommended in support of the Hong Kong Government and its plan to incorporate Tai Long Sai Wan enclave into Sai Kung East Country Park. Records of land sales in Hoi Ha and Pak Lap, two enclaves in the Sai Kung Country Parks, show how agriculture land has been sold to developers in recent years. Guess what, the new draft outline zoning plans show exactly these areas now zoned for house development – development which will damage the integrity of the country parks. Join the ‘Save Our Country Parks’ campaign here. Should we have zoning for Small House Development (left) or include enclaves into Country Parks (right)? Over 20 green groups have joined to form the “Save Our Country Parks” alliance with one simple demand: Incorporate the enclaves into the Country Parks so they can enjoy active management, park amenities and regular patrols, and development is subject scrutiny by the Country and Marine Parks Board. For years Designing Hong Kong has warned the Lands Department and Town Planning Board of the breakdown in law and order as a result of the Small House Policy. And this is set to get worse. To deal with the infinite small house demand, Government has decided on a ‘containment strategy’. Instead of ending the Small House Policy, it restricts construction of small houses to village land. The result is for residents – not village developers who filled their pockets – to resolve: Violence, criminal intimidation, and even death. With 2/3 of the V-zones are already used up, houses are now squeezed between existing ones, often on land used for access and parking. The location of small houses is chaotic as they are granted individually at different times on former paddy fields. The Lands Department does not guarantee right-of-way to small houses. Village developers are told to make their own arrangements for footpaths, vehicular access and parking. And so they do where they can with the unauthorized occupation of Government (and private) land. Below are some recent examples of village thuggery as a result of the small house policy. If boundaries of Country Parks are no longer sacrosanct, will this be the start of the end of Country Parks? Do we let the chaos of small house developments spread throughout country parks? Does the community need a new agreement on what land to protect, and how? 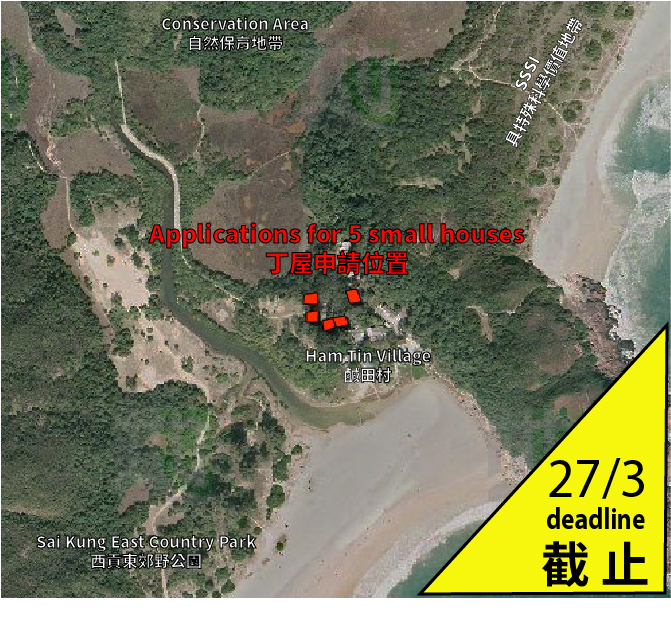 You are invited to join the ‘Save Our Country Parks’ forum in Sai Kung Town Hall, 19 October, 10:30am-1:30pm. Click here for event details. “Save Our Country Park” action by Ark Eden, Association for Geoconservation, Hong Kong, Designing Hong Kong, Friends of Hoi Ha, Friends of Sai Kung, Friends of Tai Long Wan, Friends of the Earth (Hong Kong), Greeners Action, Green Communities, Greenpeace, Green Power, Green Sense, Hong Kong Bird Watching Society, Hong Kong Dolphin Conservation Society, Hong Kong Outdoors, HKWildlife.net, Lantau Buffalo Association, Living Islands Movement,Living Seas Hong Kong, Sai Kung Tai Long Wan Concern Group, Society of Hong Kong Nature Explorers, The Conservancy Association,WWF Hong Kong etc.